Concussion and its short and long-term cognitive consequences have garnered much publicity over the past decade. Whereas multiple concussions may be associated with long-term cognitive consequences, a single concussion has been shown to cause significant neurophysiologic changes that may persist for weeks. A recent large retrospective study showed that anesthesia is not uncommon and can occur without a formal diagnosis of concussion in place. This articles discusses the perioperative considerations of a possible patient safety risk: the post-concussed brain. Concussion awareness has increased significantly among both medically trained individuals and among the general population over the last few decades. This can be attributed to a greater understanding of the effects of both acute and chronic repeated concussion on brain pathophysiology. Despite advances in our understanding of the effects of concussion on the brain, few data exist to guide the periprocedural management of patients with either acute or chronic repeated concussion. Many questions remain. Does the perianesthetic period represent a time for increased risk for brain injury in those patients with recent acute concussion or chronic repeated concussion? Should elective procedures requiring anesthesia be delayed following a concussion, and if so, for how long? What specific complications may be attributed to anesthesia in patients with concussion? Are there any periprocedural factors that can be modified to minimize risk? These and many other questions remain unanswered by the current medical literature. Concussion refers to the functional manifestations of mild traumatic brain injury (mTBI) that may result from any blow, jolt, or strike to the cranium with or without loss of consciousness.1 Although sports-related concussion have probably received the most attention, concussions can result from other mechanisms including motor vehicle accidents, falls, and assaults. Furthermore, many individuals who suffer a concussion may not seek medical care, making the determination of the true prevalence of acute concussion very difficult. For example, in 2010, the Centers for Disease Control (CDC) estimated 2.5 million traumatic brain injuries resulted in an emergency room visit, hospitalization, or death—of which 75–95% were mTBIs and concussions.2 These data omit concussions treated without medical care or with care, but in an outpatient office-based setting. In 2011, Daneshvar et al.3 estimated that 1.6–3.8 million sports-related concussions alone occurred in the United States. However, these data did not include concussions due to non-sport-related injuries. These data and the CDC strongly support the notion that concussion is a significant public health problem. Adapted from Meehan WP, 3rd, d’Hemecourt P, Comstock RD. High school concussions in the 2008–2009 academic year: mechanism, symptoms, and management. Am J Sports Med 2010;38:2405–9, with permission of the publisher, SAGE Publications, Inc./Corwin. Figure 1. Cognitive Rest vs. The Perioperative Environment. Reproduced and modified with permission from the Mayo Clinic, Rochester, MN. In 2005 and 2006, Omalu et al.20,21 described the widespread deposition of beta-amyloid and neurofibrillary tangles, pathology often appreciated post-mortem in patients with Alzheimer’s Disease,22 in the brains of Mike Webster and Terry Long, both former professional football players. This characterization of chronic traumatic encephalopathy (CTE) was suspected to be due to multiple repeated concussive injuries. Using brains donated to the Concussion Legacy Foundations “Brain Bank,” Mez et al. reported that widespread neuropathologic findings, including deposition of beta-amyloid and neurofibrillary tangles, were found with increasing frequency in those with longer football careers.23 Lower rates of neurohistopathologic findings were associated with high-school-only football involvement and much higher rates among professional football players. At this point, no data exist in the current literature that describe changes in cerebral physiology in those with suspected CTE. Anesthesia after concussion is common. Anesthesia was provided to almost 15% of patients with a concussion within a year of their injury. Surprisingly, almost half (44%) of all anesthetics occurred within one month of the injury and almost a third occurred within the first week of injury. Sports injury was not the most common cause of concussion in individuals requiring anesthesia. Motor vehicle accident-related concussions required the greatest utilization of anesthesia and comprised 36% of patients and 49% of all anesthetics. Falls were the second most common cause for anesthesia utilization comprising 35% of patients and 31% of anesthetics. Patients with sports-related concussion requiring anesthesia consisted of only 20% of the cohort and 13% of all anesthetics. Elective procedures requiring anesthesia were not uncommon after recent concussion. Twenty-nine of 552 patients (5%) underwent elective procedures requiring anesthesia that were completely unrelated to the injury that resulted in concussion within one week following their concussive injury. Anesthetics were provided to patients prior to the formal diagnosis of concussion. Seven percent of all patients did not receive a formal diagnosis of concussion until at least one week after the injury. In addition, 29 anesthetics (1.6%) were provided to patients before a concussion diagnosis was formally made. 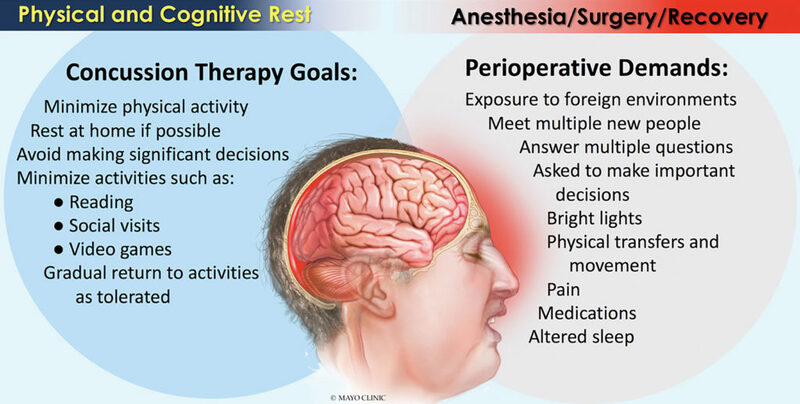 If the management of concussion centers around physical and cognitive rest, it is difficult to argue that anesthesia and the demands of a surgical procedure fulfills the prescription. First, patients presenting for surgical or diagnostic procedures requiring anesthesia enter a hospital or surgical center—a foreign environment—where they meet many different individuals, are asked a multitude of questions, and are also asked to make significant decisions. The lights are often bright in these locations. Physical demands are made when patients are asked to move to different locations or to different procedural tables or beds. Following the procedure, patients may be dealing with excessive pain, and are frequently disturbed, even during sleep, for medications and various assessments by health care providers. Frankly, the periprocedural period is NOT a restful period! However, it is true that many surgical and diagnostic procedures requiring anesthesia are necessary in patients with an acute concussion. Therefore, clinicians should be aware that elective procedures following acute concussion likely pose the antithesis of rest for the patient. Significant physiologic perturbations are common in the perianesthetic period. These can include significant and rapid changes in blood pressure due to pain, surgical stimulation, blood loss, alterations in autonomic function, and pharmacologic effects. These changes in blood pressure could potentially be detrimental to an acutely concussed brain that likely has an impaired ability to autoregulate its blood flow,13,25 making it susceptible to hypo- and hyperperfusion. Additionally, patients may be susceptible to hypoxia and alterations in other physiologic variables, such as carbon dioxide tension and blood glucose concentration—factors that could serve as a source of secondary injury to a potentially vulnerable brain.26,27 Taken together, the perianesthetic period likely represents a time where an acutely concussed brain with altered physiology may be at risk for secondary injury. Given the clinical findings of cognitive impairment, dementia, and frank motor symptoms along with brain histopathologic findings in patients with chronic repeated concussion,23 it seems obvious that the chronically concussed brain, even in the absence of recent concussion, also represents a vulnerable brain. At this point, clinicians have little guidance from the medical literature in terms of expected cerebral pathophysiology and optimal management in this cohort of patients. IS RECENT CONCUSSION A POSSIBLE PATIENT SAFETY RISK? The idea of a “vulnerable brain” in the perioperative period is being investigated in a variety of patient cohorts such as children, those with pre-existing brain injury (i.e., prior stroke, traumatic brain injury), and elderly adults. It is hard to argue that both the acutely concussed brain and the brain that has suffered chronic repeated concussions do not also represent a vulnerable brain. There is a concerted effort to identify best safety practices for the vulnerable brain to promote brain health and minimize risk for adverse events. Anesthesia professionals should have heightened awareness for concussion—diagnosed or undiagnosed—especially in patients with recent trauma. Clinicians should be aware that not all concussions are the result of sports-related injuries. Many may be due to motor vehicle accidents, falls, or assaults. Anesthesia professionals should be cautious if persistent postconcussive symptoms are present (Table 1) and may consider delaying elective procedures at least until those symptoms resolve or new data support a different end point. A discussion with the patient regarding these symptoms and the theoretical risk of exacerbating or prolonging postconcussion symptoms should be considered. More research is needed to quantify perianesthetic risk in patients with both acute and chronic repeated concussions and help guide clinicians to minimize risk to a potentially vulnerable brain. Drs. Abcejo and Pasternak are assistant and associate professors, respectively, of anesthesiology in the Department of Anesthesia and Perioperative Medicine at the Mayo Clinic in Rochester, MN. Dr. Pasternak is the current president of the Society for Neuroscience in Anesthesiology and Critical Care (SNACC). Neither author has any disclosures as they pertain to this article. McCrory P, Meeuwisse W, Dvorak J, et al. Consensus statement on concussion in sport—the 5(th) international conference on concussion in sport held in Berlin, October 2016. Br J Sports Med 2017;51:838–847. Traumatic Brain Injury and Concussion. The Centers for Disease Control and Prevention. https://www.cdc.gov/traumaticbraininjury/basics.html. Accessed on July 7, 2018. Daneshvar DH, Nowinski CJ, McKee AC, Cantu RC. The epidemiology of sport-related concussion. Clin Sports Med 2011;30:1–17, vii. Meehan WP, 3rd, d’Hemecourt P, Comstock RD. High school concussions in the 2008-2009 academic year: mechanism, symptoms, and management. Am J Sports Med 2010;38:2405–2409. Guskiewicz KM, McCrea M, Marshall SW, et al. Cumulative effects associated with recurrent concussion in collegiate football players: the NCAA Concussion Study. JAMA 2003;290:2549–2555. Bergsneider M, Hovda DA, Shalmon E, et al. Cerebral hyperglycolysis following severe traumatic brain injury in humans: a positron emission tomography study. J Neurosurg 1997;86:241–251. Yoshino A, Hovda DA, Kawamata T, Katayama Y, Becker DP. Dynamic changes in local cerebral glucose utilization following cerebral conclusion in rats: evidence of a hyper- and subsequent hypometabolic state. Brain Res 1991;561:106–119. Doshi H, Wiseman N, Liu J, et al. Cerebral hemodynamic changes of mild traumatic brain injury at the acute stage. PLoS One 2015;10:e0118061. Jantzen KJ, Anderson B, Steinberg FL, Kelso JA. A prospective functional MR imaging study of mild traumatic brain injury in college football players. AJNR Am J Neuroradiol 2004;25:738–745. Militana AR, Donahue MJ, Sills AK, et al. Alterations in default-mode network connectivity may be influenced by cerebrovascular changes within 1 week of sports related concussion in college varsity athletes: a pilot study. Brain Imaging Behav 2016;10:559–568. Stephens JA, Liu P, Lu H, Suskauer SJ. Cerebral blood flow after mild traumatic brain injury: associations between symptoms and post-injury perfusion. J Neurotrauma 2018;35:241–248. Vagnozzi R, Signoretti S, Cristofori L, et al. Assessment of metabolic brain damage and recovery following mild traumatic brain injury: a multicentre, proton magnetic resonance spectroscopic study in concussed patients. Brain 2010;133:3232–3242. Veeramuthu V, Narayanan V, Kuo TL, et al. Diffusion tensor imaging parameters in mild traumatic brain injury and its correlation with early neuropsychological impairment: a longitudinal study. J Neurotrauma 2015;32:1497–1509. Halstead ME, McAvoy K, Devore CD, et al. Returning to learning following a concussion. Pediatrics 2013;132:948–957. Sady MD, Vaughan CG, Gioia GA. School and the concussed youth: recommendations for concussion education and management. Phys Med Rehabil Clin N Am 2011;22:701–719, ix. Grool AM, Aglipay M, Momoli F, et al. Association between early participation in physical activity following acute concussion and persistent postconcussive symptoms in children and adolescents. JAMA 2016;316:2504–2514. Howell DR, Mannix RC, Quinn B, et al. Physical activity level and symptom duration are not associated after concussion. Am J Sports Med 2016;44:1040–1046. Thomas DG, Apps JN, Hoffmann RG, McCrea M, Hammeke T. Benefits of strict rest after acute concussion: a randomized controlled trial. Pediatrics 2015;135:213–223. Omalu BI, DeKosky ST, Minster RL, et al. Chronic traumatic encephalopathy in a national football league player. Neurosurgery 2005;57:128–134; discussion 128–134. Omalu BI, DeKosky ST, Hamilton RL, et al. Chronic traumatic encephalopathy in a national football league player: Part II. Neurosurgery 2006;59:1086–1092; discussion 1092–1083. Perl DP. Neuropathology of Alzheimer’s disease. Mt Sinai J Med 2010;77:32–42. Mez J, Daneshvar DH, Kiernan PT, et al. Clinicopathological evaluation of chronic traumatic encephalopathy in players of American football. JAMA 2017;318:360–370. Abcejo AS, Savica R, Lanier WL, Pasternak JJ. Exposure to surgery and anesthesia after concussion due to mild traumatic brain injury. Mayo Clin Proc 2017;92:1042–1052. Vavilala MS, Lee LA, Boddu K, et al. Cerebral autoregulation in pediatric traumatic brain injury. Pediatr Crit Care Med 2004;5:257–263. Curley G, Kavanagh BP, Laffey JG. Hypocapnia and the injured brain: more harm than benefit. Crit Care Med 2010;38:1348–1359.